Gardening, camping, really almost anything that needs to get done outdoors will go just a little bit easier with a good trowel in the toolkit. These versatile, light, handheld shovel blades can go anywhere. They allow for precision work where shovels or hoes can’t reach and just generally make themselves useful when it comes to Spring planting, or setting up a campsite. Truly, anything that involves moving material from one place to another is easier with a good trowel. That’s why these small shovels are one of those tools where quality really counts. There’s nothing worse than a trowel with a loose handle or a dull blade or one that just doesn’t seem to fit in the hand like an old friend. We’ve combed the web to find the kinds of trowels that will never let you down. No matter the weather, no matter the material from soft mulch and soil to rock hard campground dirt these are the tools that are going end up being your go-to blade when you need to get things done. We’ve included a wide variety of trowels, from straightforward, strong-bladed trowels to smaller, more compact lightweight models that fit well into a backpack. Either way, these are vital tools for anyone heading out to the garden, or off the grid for a camping or long-hiking trip. It simply doesn't get much better than Fiskars. These trowels are strong, sturdy, and come with enough add-on bells and whistles to make them quickly indispensable in every gardeners' toolkit. Everything about the design of the Ergo points towards a company that thinks before they produce a product. True to its name it supports an ergonomically designed handle that keeps fatigue to a minimum. it's polished aluminum head is strong and designed to cut through turf like butter. And just in case none of that works there's a lifetime guarantee so they'll always take it back. It feels different when you use it but different is sometimes better. That's the idea behind this ergonomically designed handle, that is specially built to minimize hand and wrist fatigue. A sturdy grip only adds to the convenience. The goal of course to design a product that allows any gardener to do what they love for longer. Looking sharp, and staying strong the blade is crafted of tough aluminum and will resist bends or breaks. It's also designed to slice through turf easily and quickly and without ever snapping or bending. This is the tool for tough ground. This is a lot of product for the money. The sturdy aluminum construction, lifetime warranty, and ergonomic handle honestly feel like they should cost more. So take advantage of this great before the company figures out how much a great trowel is really worth. When trouble comes the Edwards Bend-Proof Trowel is the tool to have in the arsenal. Billed as the most heavy-duty trowel on the market we can't argue. The one-piece stainless steel construction means it won't bend and will stand up strong against rocky or clay soil. It's got a wide trowel so it can get deeper and move more dirt around. And it also has an ergonomically designed grip that stops the trowel from slipping when the going gets tough. The blade is made of tough stainless steel to resist rust and also stand up to the hardest soil or clay lawn. It's also designed with an extra large head allowing the get deeper and get more dirt out of the way. Another great selling point that takes the guesswork out of buying a trowel. If it doesn't work. If it snaps or breaks or simply doesn't seem to fit right send it back. Edward Tools will replace it for free. That's a nice guarantee to have, especially when dealing with a lawn that's as much rock as soil. 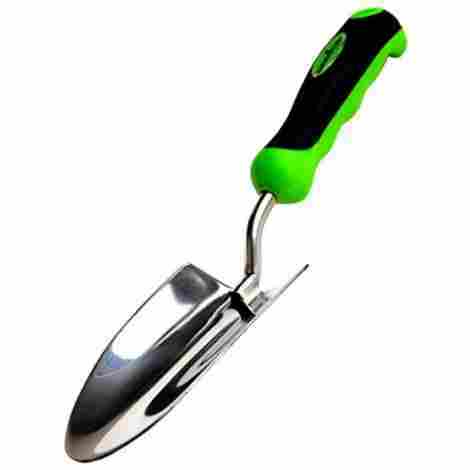 Not quite the cheapest entry in the market but with the stainless steel blade and the lifetime warranty, it's possible this might be the last trowel even the most dedicated gardener may ever buy. Add the ergonomic grip and extra large trowel space and even at a bit higher price point, this is a truly high-quality product. One trowel is good. Two trowels and a cultivator thrown in is better. This trifecta of lawn tools is the perfect setting for most small jobs around the lawn. 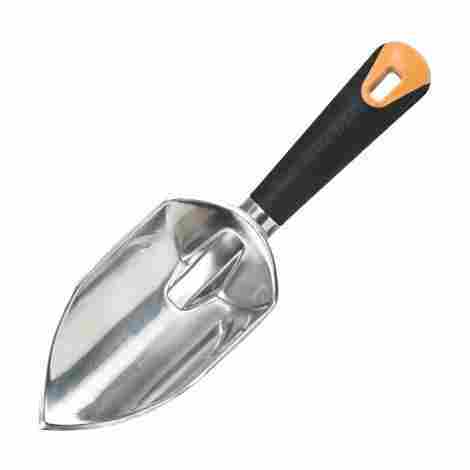 The trowel has a deep cast aluminum head that will stand up to the hard rocky soil. The transplanter has useful depth marks to ensure exact depth when planting bulbs or moving veggies from growing trays into the garden, and the cultivator is a duel use aerator, weeder, and is perfect for shaking up topsoil before adding grass seed or fertilizer. This trio of tools takes the guesswork out of tool shopping and provides everything a gardener will need to claim victory over spring seeding and transplanting or mid-summer aerating and weeding. It's a thoughtful pairing from Fiskars but exactly what we've come to expect from this well run Finnish company. 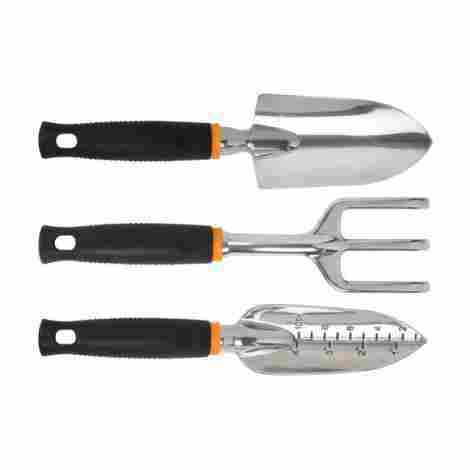 This three in one kit is incredibly economical and the price point matches some of the single trowels included on our list. And as always Fiskars provides a lifetime warranty so if anything ever happens to the cast aluminum blade or handle simply return it with a warranty claim, and get a new tool in no time. The Wilcox is a unique looking entry into our best trowels list. It's almost a specialty product with a long thin blade that comes in a wide array of sizes ranging from 10 to 22 inches. Almost like spear points, these blades work great to break up rocky or hard packed soil. They're made to take the heat, crafted of a single piece of tough 16 gauge metal and comes with a simple ribbed handle and an leather cord for easy storage. This trowel is built to last. Its long tapered style is one single piece of tough 16 gauge steel. Making it more than tough enough to take on rocky or high clay soil and not bend or break. These trowels come in a variety of lengths and have depth markings etched into the blade making them perfect for not only breaking up hard soil but also gauging the perfect depth for planting bulbs or seedlings. The stainless steel construction puts this product on the pricier side. But you get what you pay for as the stainless steel construction marks this as a trowel that's built to last, and unlikely to bend, break or even dent. Fiskars again, and it's hard to tell from the snapshot but like the name implies this is a BIG trowel. It's not just the grip that's big it's the trowel itself and that allows gardeners to move more soil, fertilizer, seed whatever it is they're working with this is the trowel to use when the going gets tough. Like all Fiskars products, it has a cast aluminum blade and large grips to keep sweaty hands from slipping. all in all, a big tool for big jobs. Everything about the Big Grip is large, the blade the handle, and the depth of the scoop which allows anyone working in the dirt to get more done. And the Big Grip handle allows a constant good grip and reduces fatigue. All in all a well-designed trowel. The handle is wrapped in a soft gripping material that lets you keep a firm hold on the hottest, sweatiest days. It's also designed with Fiskars neutral wrist position design to reduce fatigue in the hands and wrist. 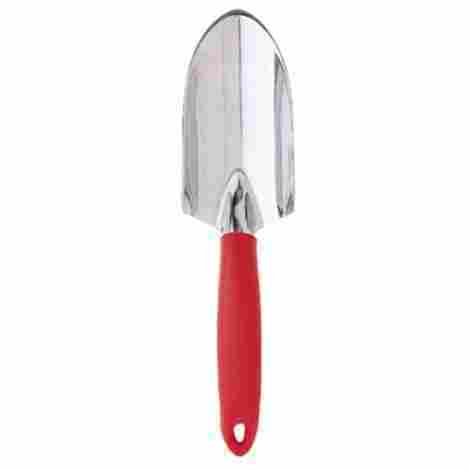 A bit more than your normal trowel but with an extra large scoop, the soft durable handles and the rust-resistant cast aluminum blade this may be worth a few dollars more. And like most Fiskars products it comes with a lifetime warranty. The camper's friend this brightly colored multi-purpose tool will come in handy no matter what the outback might throw at anyone who's cutting their own trail. 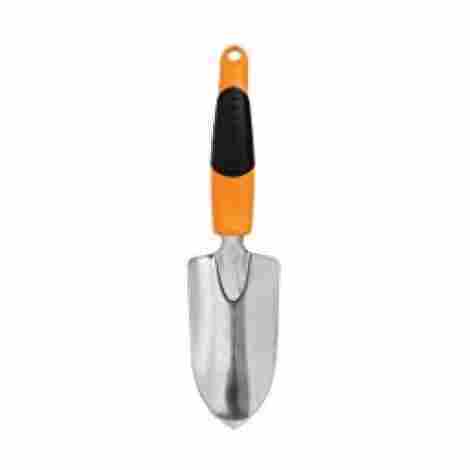 Made of strong styrene this trowel will stand up to dirt, snow, mud rocky soil. It's bright orange color also makes it easy to see in low light on the trail when nature calls. Unlike most of the trowels on our list, this backpackers trowel is made of Styrene a strong resilient no rust plastic with the added bonus that it will never rust. It's also lighter than metal and small so perfect for backpacking. One of the most common complaints about every trowel with a separate handle and blade is that they break. No problem here, this trowel is a simple one-piece handle and blade construction that won't ever separate. This styrene one piece trowel is cheap. And it's meant to be, as a simple add-on tool for backpackers and hikers. It won't be much help in the garden but for anyone planning on heading out into the natural world, this is a simple cheap tool that will make itself useful in all kinds of ways. Billing itself as the go-to gardener's tool might not be false advertising. The Garden guru has all kinds of features that let it stand out from the rest of the trowel crowd. A thick, rust scratch and dent resistant stainless steel blade is the first thing that comes to mind. Add the ergonomic handle with thumb rest and finger grooves and this just comes across as a well-designed product. and in case it fails it comes with a lifetime guarantee and a 24/7 customer assistance line. Clearly, a lot of thought went into the design of the handle on the Garden Guru trowel. It has an ergonomic grip to reduce fatigue, a thumb rest and finger grooves on the bottom. It's distinctive color also just makes it look cool. At the end of the day, a trowel is only as good as its blade and this one doesn't disappoint. It feels sturdy and thick and it is! 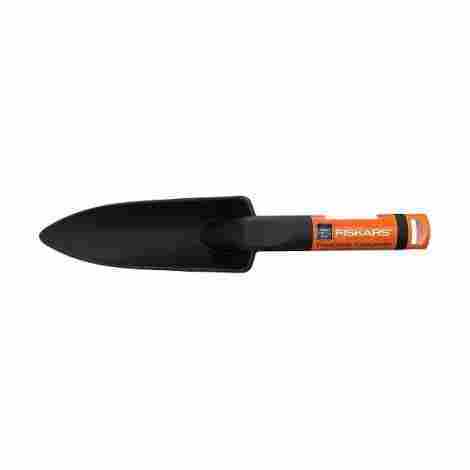 It's an ideal trowel to turn the toughest topsoil, dig around buried rocks or power through the hardest packed clay. You get what you pay for, and this doesn't come cheap. But it's a well-designed product and there's nothing flimsy or second-rate about the Garden Guru tool. It's built to last and it comes with a lifetime guarantee and 24/7 assistance in case it does come up against a job it can't handle. This is a high-end tool. Sometimes simple is just the best way to go. And the Corona is nothing if not simple, but that doesn't mean it isn't a high-quality product. It's lightweight but with a 3-inch blade that will get the job done. The aluminum blade will cut through the tough stuff, and the handle is brightly colored and designed with a comfort grip that will keep up with even the most dedicated gardener. Light, sturdy, and well designed this trowel was built with convenience in mind. The aluminum blade is tough and rust resistant and the comfort grip handle resists wrist and hand fatigue. A simple go-to trowel that will stand the test of time. It's all about that blade, and this one comes ready to work. 3 inches wide and 12 inches long, it will do everything the weekend gardener needs and more. Plus the strong aluminum construction is strong and designed to stand up to any kind of soil. This is a Simple, convenient, no-nonsense trowel and that philosophy is reflected in the price. It comes cheap, but isn't made cheaply and with a bit of care it should stand the test of time. But just in case this trowel comes with a limited lifetime warranty. It doesn't get much simpler than this. 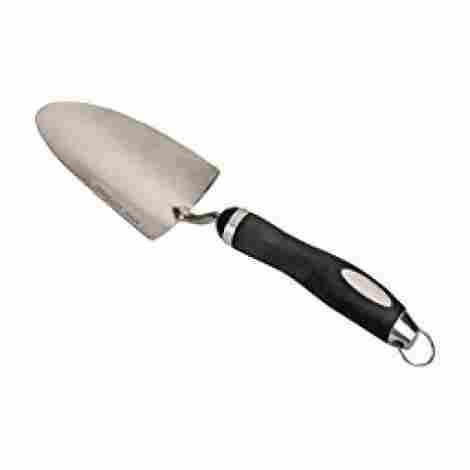 The Deuce isn't necessarily a typical trowel though it's strong and resilient enough to help out in the garden. No, this is designed for backpackers who are spending days out into the field and want a small and simple tool that will help them do everything build a fire-pit to a cathole quickly and deeply. It's basically a curved aluminum blade. It takes up next to no room in a backpack but punches above it's in usefulness and durability. This trowel is only about 6 inches tall and made of thin but strong aluminum. The blade slips through soil easily, and for the harder stuff simply flip it over and use the curved handle to cut down into the harder soil. Don't like it? Simply send it back and they'll take it back. But the company prides itself on collecting all of the different ways owner use the Deuce, shoehorn? Check! Bottle opener? Check! Plus, it's small enough to fit into luggage so you can bring it onto the flight without having to worry that it'll be confiscated during check-in. Not quite as cheap as we'd hope but this is one of those tools that might end up just hanging around, in a back pocket or in a backpack. There are simply too many ways to use this tool to list but we suspect that the Deuce might just become indispensable. The perfect melding of form and function this Fiskars fiber composite trowel is one that hits every mark of quality that we look for. One of the big selling points is its one-piece design, that ensures that it will never ever be that lawn tool that comes off of its handle. Not only that but it's made of a strong Nylon fiberglass composite that ensures it won't bend or break even in the hardest packed dirt or if it hits a hidden rock during planting season in the garden. It's lightweight and thing making sure it won't take up precious space in a backpack making it a great tool when the next stop is off the grid. Nyglass is a super strong Nylon fiberglass composite. What that means is that this blade won't rust, nick or bend no matter what it's put through. 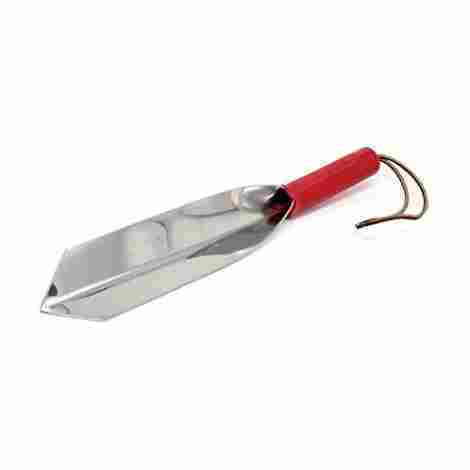 That also means it's much lighter than its metal counterparts, so light it's a great starter trowel for kids or a great companion for the next backpacking trip. A godsend for anyone who wants a tool that will stand the test of time. Garden tools can be notoriously short-lived and eventually any joint wears out, be it a knee or the place where the wooden handle meets steel blade. 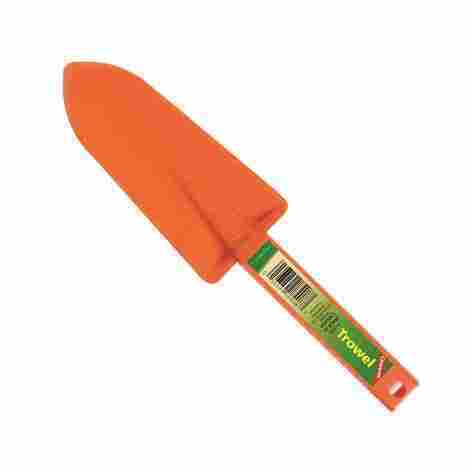 but Fiskars crafts its trowels as one continuous piece nylon composite piece. There are no parts to wear out or slip so it'll be around as long as its needed. This won't put hardly a dent in the wallet. A great selling point but there's more: gradation marks for exact soil depth, the strong nylon composite blade, and lightweight and we're talking a lot of tool for the money. So much so that this can seem like an absolute steal, so don't let the low price tag fool you into thinking this a low-quality trowel. Praise the trowel! This is the tool everyone needs in their gardening arsenal. Their versatility and their multi-function design make them the one tool it’s hard to do without. And because they’re so important to take the time to make sure you get the tool that is going to get the job done, and that’s built to last. There are a lot of price ranges and a lot of designs here and that means a lot of choices. So take the time to choose between aluminum, plastic or stainless steel. We get some negative feedback on aluminum and plastic and the word ‘flimsy’ gets tossed around a lot in the negative comments. Also, pay attention to one-piece versus two-piece construction. On almost every two-piece product there is at least one report of a trowel coming apart at those seams. Take some time to look for an ergonomic handle that won’t strain your wrist or hands. And if you’re a backpacker pick one of our lightweight options. And finally, almost all these trowels come with some kind of guarantee but not all, so keep that in mind as you walk through our list.